Stanley V. Genetti, 88, died Sunday morning at Hazleton General Hospital after a lengthy illness. He was born Dec. 27, 1889 in Austria, son of Damiano and Oliva (Zambotti) Genetti. He had been chairman of the board of Genetti’s Super Markets and had been officer, partner or director of other Genetti-owned enterprises and companies. 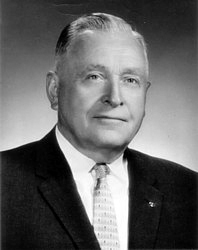 He had been past president and member of the Pennsylvania Food Merchants Association; past director and member of the National Association of Retail Grocers of the United States; and was active in civic affairs of the community for many years. At his death, he served as chairman of the board of Pantry Quik. Preceding him in death were a son, Richard who died in 1983; two brothers, Leon Sr., August Sr., four sisters, Tillie Genetti Zambotti, Dora Bott, Esther Genetti, and Irma Branz. Surviving are his wife, the former Eleanor Rauzi; a daughter, Beverly Perry, McLean, VA; a son, Edward F., Hazleton; brother, Albert V,; sister, Mrs. Anne McNelis; 15 grandchildren; one great-grandchild; and a number of nieces and nephews. The funeral will be held Wednesday at 9 am from the Boyle Funeral Home, Mass of Christian Burial will be celebrated in St. Gabriel’s Church at 9:30 am. Interment will be in Calvary Cemetery, Drums. Friends may call at the funeral home Tuesday from 7 to 9 pm.